Welcome! If you are reading this, you have been patient enough to grow a beard, accepted the itch which comes with it & now understand very well that your beard demands as much attention as the hair on your head. Long gone are the days when ‘beard maintenance’ only meant not shaving. With good care and a modicum of grooming, a bearded look can look just as neat and professional as a clean shave. Hope we are able to add something to the lives of our fellow beards-men. We’ve collected some basic tips from personal experience, by listening to our dads, uncles and those-who-came-before-us talk about their personal experiences, and yes, by hours of comparison between the majestic beards of Gandalf The Grey & Gandalf The White from our beloved Lord of the Rings. The first and most important thing is to find a beard style that goes with your face & helps define your jawline. A square shape can help you achieve that perfect jawline if you have a round face. Other styles that you can choose from are full beard, old Dutch beard, jawline beard, circle beard and goatee, to name a few. Unlike our face, which needs to be washed twice a day, you do not need to wash your beard every day. This can differ depending on the hours that you spend outdoors or the weather of the country in which you live. In a country like ours, you should probably wash your beard once in two days. The reason for this is that our body produces natural oils which keeps the beard happy & healthy. 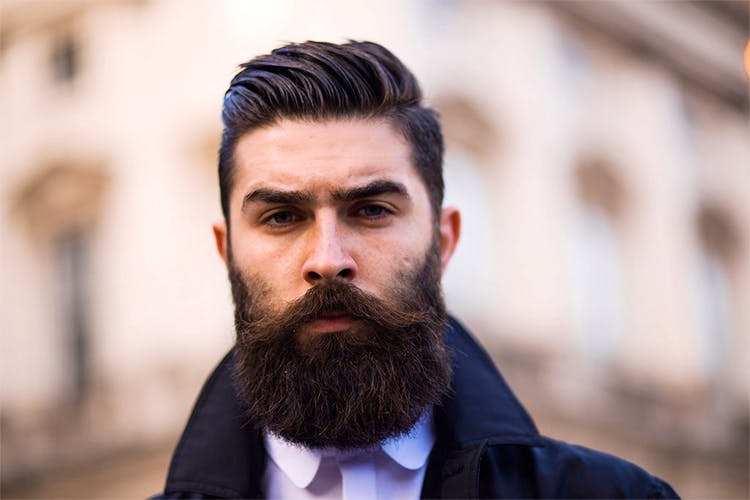 If we wash it everyday, chances are we may be stripping it off the natural oils that are important for a healthy beard. Use a mild cleanser. Body washes and regular soaps may strip your beard of its natural oils, making it dry and scruffy. Your choices are to use either a cleanser formulated specially for the face & beard, or a shampoo. If you do choose shampoo, make sure you use it just for the beard hair and use a face wash separately for the rest of your face. Once washed, pat the beard dry and use beard oil for a happy and healthy beard. A dab of virgin coconut oil rubbed between your palms and lightly applied on your beard also does wonders. Every time you shave, you exfoliate by default. Since shaving is off the table in our case, the exposed part of our face needs to be exfoliated as that scrubs away dead skin cells & unclogs the pores on your skin, keeping it healthy and clean. It also helps expose your beard hair follicles. To exfoliate, get your face wet, massage your face in circular motions using a small amount of exfoliator. Do not scrub too hard. After about half a minute, rinse clean. Make sure you use a moisturizer to save your skin from getting too dry. An ideal time to exfoliate would be once a week.